Use these connectors to extend your optical cables. They are designed to couple two (2) Toslink cables together. They are designed with two (2) Toslink jacks, one on each end of the barrel shaped connector so the optical signals are not refracted. 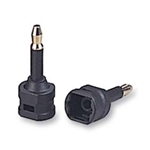 Use these adaptors to convert between mini phone plugs and optical fiber (Toslink) connectors. These devices are to be used with equipment that use 3.5mm mini phone jacks as the optical connection. If the mini phone jack is not an optical input, you will have to use HS6884 or HS8127 to convert the signal. 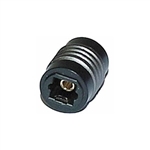 COM-V CABLE 6' Swivel adapter is ideal for locations that are a tighter fit, and need for cable to immediately point to up/down or any angle. It provides you 360 degree flexibleness of wiring. All our HDMI ptoducts are purchased from manufacturers that are CERTIFIED by hdmi.org.